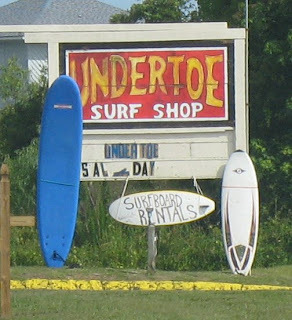 Today I'll feature a series of business signs you can find at Topsail Beach. Good times! Here's one for the One Stop Bait and Tackle. 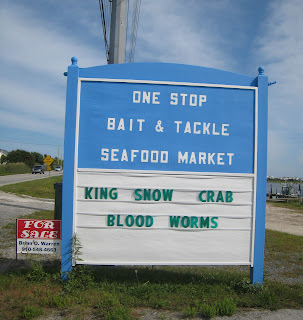 There's nothing inherently strange about this business, since it makes sense that you'd get your fresh seafood at the same place where you can find your bait. But I think that this sign works against anything appetizing about a snow crab dinner. Mmmmmmm....blood worms make a wonderful side dish. This is a furniture outlet down near the beach. 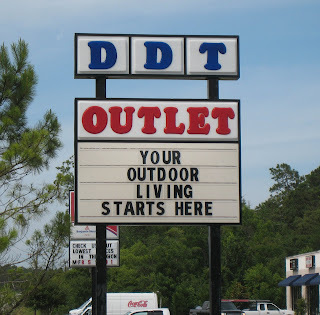 I'm sure they have great deals--because after all, "your outdoor living begins here"--but I find this an unfortunate name. Would you want your business associated, even inadvertently, with dichlorodiphenyltrichloroethane? I guess there's something endearing about this obvious, and I assume intentional, misspelling. It's sort of fun. Foot references are always hip. Here's one for a restaurant on the island that caters to the Happy Days-loving crowd. A couple of things bug me about this sign. First, what exactly is that weird jukebox creature thing? 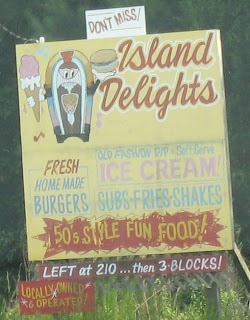 Also, what kind of fare is considered "50s style fun food"? Whatever it is, I hope it doesn't involve Potsie. At first glance, this sign is ridiculous. Most people, I think, would find $7.99 towels a tad more than the advertised price limits. However, in very small type (especially small when seen from the road) the words "selected sections" can be found under the advertised $5.99. Still, it's rather deceptive. 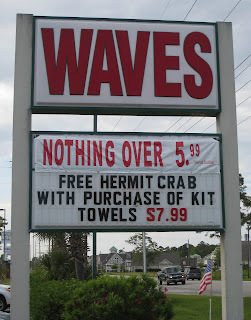 Oh, and don't forget the free hermit crab. I wonder if it comes with blood worms?